Meetings are packed with great activities – meet a pilot, learn about wild plants, do some fly tying, and more! Share your thoughts on a book that’s not only award-winning, but also very popular! Hatchet is an edge-of-your-seat ride that’s sure to keep you coming back for more. 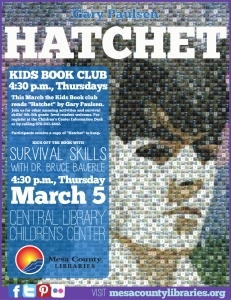 Book Clubbers will get their own copy of Hatchet to keep. Anyone can come check out the kickoff presentation – stop by for survival skills, and stay for the book if you’re interested! ← Our One Book Committee Thanks You!